In today’s economic climate, many taxpayers find themselves with back tax balances they are unable to pay. When faced with this situation, the worst choice a taxpayer can make is to ignore the problem and hope that it will go away. The consequences of disregarding an overdue tax liability can be severe and, with more resources being allocated to the IRS for enforcement, it is going to be increasingly difficult for taxpayers who have back tax balances to remain under the radar. The best course of action is to pay the back tax balance in full if resources allow and, if not, to make maximum use of the use of the tax settlement options offered by the IRS. Although numerous new tax resolution programs have recently been initiated, the qualifying criteria are complex and may be confusing. For this reason, a taxpayer who owes back taxes may be best served by contacting a tax settlement professional for help in determining which option will offer the most effective resolution for their specific set of circumstances. Assessment of Interest and Penalties –Back tax balances are compounded over time by the addition of interest and penalties to the extent that is not uncommon for these additional charges to total as much as 50% of the original tax liability. Interest – Because the IRS considers a back tax balance to be the equivalent of a loan from them, they charge interest on the tax amount due. The interest rate, which changes every three months, is calculated by taking the federal short term rate and adding 3%. Penalties – A failure-to-pay penalty is assessed at the rate of 0.25% to 1% of the back tax amount due for each month that there is an unpaid balance. The maximum amount that this penalty can reach is 25% of the original tax amount owed. Enforced Collection Activities – Although the IRS will begin the process of collecting back taxes with passive techniques such as the issuing of an IRS letter or an IRS Notice, the collection methods become more aggressive the longer the tax bill is left unpaid. 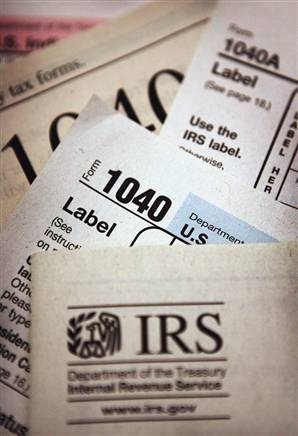 Eventually, the IRS may file a tax lien, issue a tax levy or initiate a wage garnishment. Liens – A tax lien is a method the IRS uses to ensure the collection back taxes by holding an ownership stake against one or more of a taxpayer’s assets. A lien can be placed on a bank account, a property or any other asset that has a significant value. Levies – A levy is the actual seizure of a taxpayer’s property to satisfy a tax debt. The IRS can levy physical assets, bank accounts, retirement accounts, dividends, wages and numerous other assets. A levy is one of the final steps in the taken in an attempt to collect back taxes and is usually exercised only after all other collection attempts have failed. Wage Garnishment – A wage garnishment is an aggressive collection technique used by the IRS to collect back taxes. When the agency issues a wage garnishment, it directs the delinquent taxpayer’s employer to deduct a predetermined amount from each paycheck and to forward that amount to them. The easiest way to resolve a back tax balance is to pay the full amount owed without delay. If sufficient funds are not readily available, the taxpayer can consider taking out a bank loan, withdrawing from a retirement account or putting the balance of the back taxes owed on a credit card. A short term administration extension can be requested when a taxpayer will have the necessary finds to pay a back tax bill within 120 days. Although interest will continue to accrue, no collection activity will be initiated by the IRS during the period of the extension. Penalty Waiver – A penalty waiver is a type of tax settlement option offered by the IRS whereby the agency agrees to reduce or eliminate previously assessed penalties when the delinquent taxpayer can show that they acted in a prudent and reasonable manner but were unable to meet their tax obligations due to circumstances that were beyond their control. Installment Agreement – An Installment Agreement is a payment plan negotiated with the IRS or State Tax Agency to facilitate the repayment of back taxes for a taxpayer who cannot afford to pay the full amount of a tax debt at one time. The amount of the payment and the length of the repayment period are generally based on the balance of back taxes owed together with the current and projected financial status of the taxpayer. Approval for this settlement option is almost automatic if the taxpayer is in good standing with the IRS and the balance of the back taxes owed is less than $10,000. Partial Payment Installment Agreement – The Partial Payment Installment Agreement is a tax settlement option that allows a taxpayer to settle an outstanding tax liability for less than the full amount owed. Because the collecting tax agency is agreeing to accept partial payment of the tax debt, the taxpayer must submit documentation showing that they are unable to pay the entire balance due. The terms of the Partial Payment Installment Agreement are normally negotiated on the basis of the balance of back taxes owed together with the financial situation of the delinquent taxpayer. Offer in Compromise – The Offer in Compromise is another tax settlement option whereby the IRS allows a taxpayer to settle an outstanding tax debt for less than the full balance of back taxes owed. The acceptance criteria for this settlement option are very specific and require the thorough documentation of the delinquent taxpayer’s assets and liabilities. An Offer in Compromise is usually granted only when the IRS determines that it is very unlikely that they will be able to pay the full balance of back taxes owed within a reasonable period of time. Innocent Spouse Relief – Innocent Spouse Relief is a tax resolution option that is used to relieve one spouse from all or part of a tax liability that was established by a joint tax return. This form of tax relief is granted when one spouse omits income, improperly reports income or reports improper deductions, unbeknownst the other spouse. If you have a back tax balance that you are unable to pay, our tax settlement professionals can help you determine the best course of action to resolve it. For more information about our services, please check out our plentiful resources here at www.professionaltaxresolution.com. With over 16 years in the business of resolving tax debt, we have a thorough understanding of tax law together with the experience to know which settlement option will be the best fit for your specific set of circumstances. To receive a free, no-obligation consultation, simply give us a call at (877)-889-6527 or submit our consultation request form. From the first day, you speak with licensed tax experts. We don't employ salespeople. We never use "affiliates" or "partners." We are not a marketing company. We will never make false claims or promises we can't keep.